Central retinal vein occlusion (CRVO) is a common retinal vascular disorder. Clinically, CRVO presents with variable visual loss; the fundus may show retinal hemorrhages, dilated tortuous retinal veins, cotton-wool spots, macular edema, and optic disc edema. Note the images below. 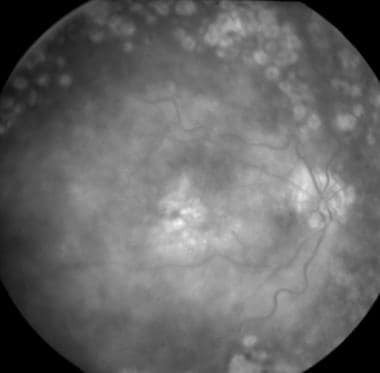 Recent onset central retinal vein occlusion, showing extensive hemorrhages in the posterior pole and giving the "blood and thunder appearance." Peripheral fundus view of the same patient with central retinal vein occlusion as in the previous image, showing hemorrhages extending all over the fundus. Fluorescein angiograph of same patient with central retinal vein occlusion as in previous images, showing hypofluorescence due to blockage from hemorrhages in the retina. It is not useful to perform a fluorescein angiogram in acute stages of the disease. Fundus picture of the same patient with central retinal vein occlusion as in previous images, showing resolving neovascularization of the disc and panretinal photocoagulation scars. Fluorescein angiogram of the same patient with central retinal vein occlusion as in the previous images, taken more than 1 year later, showing persistent cystoid macular edema with good laser spots. Broadly, CRVO can be divided into 2 clinical types, ischemic and nonischemic. In addition, a number of patients may have an intermediate presentation with variable clinical course. On initial presentation, it may be difficult to classify a given patient into either category, since CRVO may change with time. A number of clinical and ancillary investigative factors are taken into account for classifying CRVO, including vision at presentation, presence or absence of relative afferent pupillary defect, extent of retinal hemorrhages, cotton-wool spots, extent of retinal perfusion by fluorescein angiography, and electroretinographic changes. Nonischemic CRVO is the milder form of the disease. It may present with good vision, few retinal hemorrhages and cotton-wool spots, no relative afferent pupillary defect, and good perfusion to the retina. Nonischemic CRVO may resolve fully with good visual outcome or may progress to the ischemic type. Note the images below. Patient with nonischemic central retinal vein occlusion presented with dilated, tortuous veins and superficial hemorrhages. 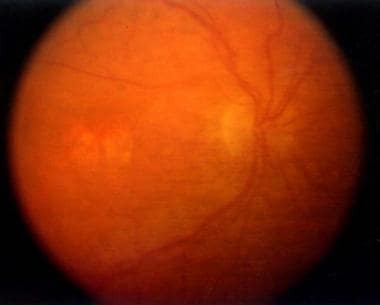 Fundus picture of the same patient with central retinal vein occlusion as in previous image, showing resolved hemorrhages and pigmentary changes in the macula several months later. Ischemic CRVO is the severe form of the disease. CRVO may present initially as the ischemic type, or it may progress from nonischemic. 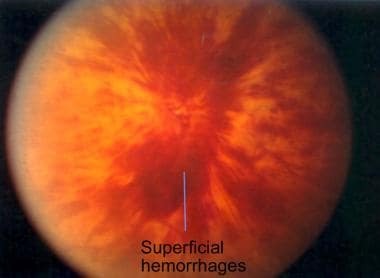 Usually, ischemic CRVO presents with severe visual loss, extensive retinal hemorrhages and cotton-wool spots, presence of relative afferent pupillary defect, poor perfusion to retina, and presence of severe electroretinographic changes. In addition, patients may end up with neovascular glaucoma and a painful blind eye. The central retinal artery and vein share a common adventitial sheath as they exit the optic nerve head and pass through a narrow opening in the lamina cribrosa. Because of this narrow entry in the lamina cribrosa, the vessels are in a tight compartment with limited space for displacement. This anatomical position predisposes to thrombus formation in the central retinal vein by various factors, including slowing of the blood stream, changes in the vessel wall, and changes in the blood. Arteriosclerotic changes in the central retinal artery transform the artery into a rigid structure and impinge upon the pliable central retinal vein, causing hemodynamic disturbances, endothelial damage, and thrombus formation. This mechanism explains the fact that there may be an associated arterial disease with central retinal vein occlusion (CRVO). However, this association has not been proven consistently, and various authors disagree on this fact. Thrombotic occlusion of the central retinal vein can occur as a result of various pathologic insults, including compression of the vein (mechanical pressure due to structural changes in lamina cribrosa, eg, glaucomatous cupping, inflammatory swelling in optic nerve, orbital disorders); hemodynamic disturbances (associated with hyperdynamic or sluggish circulation); vessel wall changes (eg, vasculitis); and changes in the blood (eg, deficiency of thrombolytic factors, increase in clotting factors). Occlusion of the central retinal vein leads to the backup of the blood in the retinal venous system and increased resistance to venous blood flow. This increased resistance causes stagnation of the blood and ischemic damage to the retina. It has been postulated that ischemic damage to the retina stimulates increased production of vascular endothelial growth factor (VEGF) in the vitreous cavity. Increased levels of VEGF stimulate neovascularization of the posterior and anterior segment (responsible for secondary complications due to CRVO). Also, it has been shown that VEGF causes capillary leakage leading to macular edema (which is the leading cause of visual loss in both ischemic CRVO and nonischemic CRVO). The prognosis of CRVO depends upon the reestablishment of patency of the venous system by recanalization, dissolution of clot, or formation of optociliary shunt vessels. Central retinal vein occlusion (CRVO) and branch retinal vein occlusion constitute the second most common retinal vascular disorder. The nonischemic type is more common than the ischemic type. 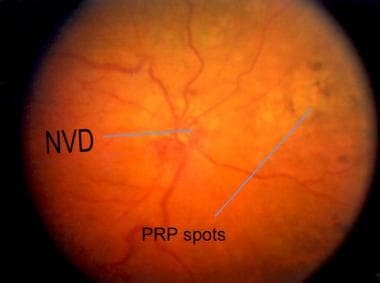 A large population-based study in Israel reported a 4-year incidence of retinal vein occlusion of 2.14 cases per 1000 of general population older than 40 years and 5.36 cases per 1000 of general population older than 64 years. CRVO is not associated directly with increased mortality. Nonischemic CRVO may resolve completely without any complications in about 10% of cases. In about 50% of patients, vision may be 20/200 or worse. One third of patients may progress to the ischemic type, commonly in the first 6-12 months after presentation. In more than 90% of patients with ischemic CRVO, final visual acuity may be 20/200 or worse. Anterior segment neovascularization with associated neovascular glaucoma develops in more than 60% of cases. This can happen within a few weeks and up to 1-2 years afterward. It has been reported that the fellow eye may develop retinal vein occlusion in about 7% of cases within 2 years. In another report, the 4-year risk of developing second venous occlusion is 2.5% in the same eye and 11.9% in the fellow eye. Neovascular glaucoma may result in a painful blind eye. CRVO does not have any particular racial preference. CRVO occurs slightly more frequently in males than in females. More than 90% of CRVO occurs in patients older than 50 years, but it has been reported in all age groups. For nonischemic CRVO, complete recovery with good visual recovery occurs only in about 10% of cases. Fifty percent of patients will have 20/200 or worse vision. About one third of patients convert to ischemic CRVO. CVOS noted that, of 547 eyes initially diagnosed to have nonischemic central retinal vein obstructions, 185 (34%) progressed to become ischemic central retinal vein obstructions within 3 years; 15% converted within the first 4 months. For ischemic CRVO, more than 90% of patients will have 20/200 or worse vision. About 60% of patients develop ocular neovascularization with associated complications. About 10% of patients can develop CRVO or other type of vein occlusions within either the same eye or the contralateral eye within 2 years. The long-term prognosis of CRVO has significantly improved with new anti-VEGF agents and steroids, maintaining good visual acuity for a long duration in most patients, except those with severe ischemic maculopathy. Development of neovascular complications has also decreased with continued monitoring and anti–VEGF treatment. Good control of systemic medical problems is important, as are regular medical and ophthalmologic checkups. Central Vein Occlusion Study Group. Natural history and clinical management of central retinal vein occlusion. [published erratum appears in Arch Ophthalmol 1997 Oct;115(10):1275]. Arch Ophthalmol. 1997 Apr. 115(4):486-91. [Medline]. Hayreh SS. Classification of central retinal vein occlusion. Ophthalmology. 1983 May. 90(5):458-74. [Medline]. Hayreh SS. Retinal vein occlusion. Indian J Ophthalmol. 1994 Sep. 42(3):109-32. [Medline]. Hayreh SS, Zimmerman MB, Podhajsky P. Incidence of various types of retinal vein occlusion and their recurrence and demographic characteristics. Am J Ophthalmol. 1994 Apr 15. 117(4):429-41. [Medline]. Williamson TH. Central retinal vein occlusion: what's the story?. Br J Ophthalmol. 1997 Aug. 81(8):698-704. [Medline]. David R, Zangwill L, Badarna M, et al. Epidemiology of retinal vein occlusion and its association with glaucoma and increased intraocular pressure. Ophthalmologica. 1988. 197(2):69-74. [Medline]. Ota M, Tsujikawa A, Kita M, et al. Integrity of foveal photoreceptor layer in central retinal vein occlusion. Retina. 2008 Nov-Dec. 28(10):1502-8. [Medline]. Klein R, Moss SE, Meuer SM, et al. The 15-year cumulative incidence of retinal vein occlusion: the Beaver Dam Eye Study. Arch Ophthalmol. 2008 Apr. 126(4):513-8. [Medline]. Mitchell P, Smith W, Chang A. Prevalence and associations of retinal vein occlusion in Australia. The Blue Mountains Eye Study. Arch Ophthalmol. 1996 Oct. 114(10):1243-7. [Medline]. Rogers S, McIntosh RL, Cheung N, Lim L, Wang JJ, Mitchell P, et al. The prevalence of retinal vein occlusion: pooled data from population studies from the United States, Europe, Asia, and Australia. Ophthalmology. 2010 Feb. 117 (2):313-9.e1. [Medline]. Central Vein Occlusion Study Group. Baseline and early natural history report. Arch Ophthalmol. 1993 Aug. 111(8):1087-95. [Medline]. Glacet-Bernard A, les Jardins GL, Lasry S, Coscas G, Soubrane G, Souied E, et al. Obstructive sleep apnea among patients with retinal vein occlusion. Arch Ophthalmol. 2010 Dec. 128(12):1533-8. [Medline]. Cekic O, Chang S, Tseng JJ, et al. Intravitreal triamcinolone treatment for macular edema associated with central retinal vein occlusion and hemiretinal vein occlusion. Retina. 2005 Oct-Nov. 25(7):846-50. [Medline]. Central Vein Occlusion Study Group. 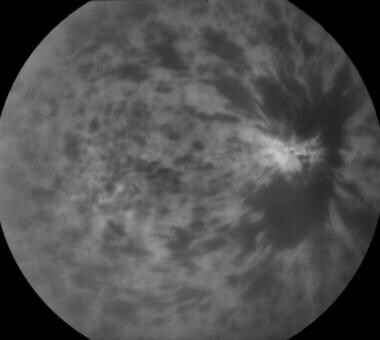 Evaluation of grid pattern photocoagulation for macular edema in central vein occlusion. The Central Vein Occlusion Study Group M report. Ophthalmology. 1995 Oct. 102(10):1425-33. [Medline]. Catier A, Tadayoni R, Paques M, et al. Characterization of macular edema from various etiologies by optical coherence tomography. Am J Ophthalmol. 2005 Aug. 140(2):200-6. [Medline]. Baxter GM, Williamson TH. Color Doppler flow imaging in central retinal vein occlusion: a new diagnostic technique?. Radiology. 1993 Jun. 187(3):847-50. [Medline]. Moschos MM, Moschos M. Intraocular bevacizumab for macular edema due to CRVO. A multifocal-ERG and OCT study. Doc Ophthalmol. 2008 Mar. 116(2):147-52. [Medline]. Gupta B, Grewal J, Adewoyin T, et al. Diurnal variation of macular oedema in CRVO: prospective study. Graefes Arch Clin Exp Ophthalmol. 2008 Dec 4. [Medline]. Chan EW, Eldeeb M, Sun V, Thomas D, Omar A, Kapusta MA, et al. Disorganization of Retinal Inner Layers and Ellipsoid Zone Disruption Predict Visual Outcomes in Central Retinal Vein Occlusion. Ophthalmol Retina. 2019 Jan. 3 (1):83-92. [Medline]. [Full Text]. Khayat M, Williams M, Lois N. Ischemic retinal vein occlusion: characterizing the more severe spectrum of retinal vein occlusion. Surv Ophthalmol. 2018 Nov - Dec. 63 (6):816-850. [Medline]. [Full Text]. Kashani AH, Lee SY, Moshfeghi A, Durbin MK, Puliafito CA. OPTICAL COHERENCE TOMOGRAPHY ANGIOGRAPHY OF RETINAL VENOUS OCCLUSION. Retina. 2015 Nov. 35 (11):2323-31. [Medline]. [Full Text]. Khodabandeh A, Shahraki K, Roohipoor R, Riazi-Esfahani H, Yaseri M, Faghihi H, et al. Quantitative measurement of vascular density and flow using optical coherence tomography angiography (OCTA) in patients with central retinal vein occlusion: Can OCTA help in distinguishing ischemic from non-ischemic type?. Int J Retina Vitreous. 2018. 4:47. [Medline]. [Full Text]. Breton ME, Quinn GE, Keene SS, et al. Electroretinogram parameters at presentation as predictors of rubeosis in central retinal vein occlusion patients. Ophthalmology. 1989 Sep. 96(9):1343-52. [Medline]. Sato E, Yamamoto S, Ogata K, et al. Changes of electroretinogram without improvement of retinal circulation after radial optic neurotomy for central retinal vein occlusion. ERG changes after RON for CRVO. Doc Ophthalmol. 2008 Mar. 116(2):153-8. [Medline]. Green WR, Chan CC, Hutchins GM. Central retinal vein occlusion: a prospective histopathologic study of 29 eyes in 28 cases. Retina. 1981. 1:27-55. Yeh S, Kim SJ, Ho AC, Schoenberger SD, Bakri SJ, Ehlers JP, et al. Therapies for macular edema associated with central retinal vein occlusion: a report by the American Academy of Ophthalmology. Ophthalmology. 2015 Apr. 122 (4):769-78. [Medline]. [Full Text]. Ip MS, Scott IU, VanVeldhuisen PC, et al. A randomized trial comparing the efficacy and safety of intravitreal triamcinolone with observation to treat vision loss associated with macular edema secondary to central retinal vein occlusion: the Standard Care vs Corticosteroid for Retinal Vein Occlusion (SCORE) study report 5. Arch Ophthalmol. 2009 Sep. 127(9):1101-14. [Medline]. [Full Text]. Aref AA, Scott IU, Oden NL, Ip MS, Blodi BA, VanVeldhuisen PC, et al. Incidence, Risk Factors, and Timing of Elevated Intraocular Pressure After Intravitreal Triamcinolone Acetonide Injection for Macular Edema Secondary to Retinal Vein Occlusion: SCORE Study Report 15. JAMA Ophthalmol. 2015 Sep. 133 (9):1022-9. [Medline]. [Full Text]. Haller JA, Bandello F, Belfort R Jr, et al. Randomized, sham-controlled trial of dexamethasone intravitreal implant in patients with macular edema due to retinal vein occlusion. Ophthalmology. 2010 Jun. 117(6):1134-1146.e3. [Medline]. Brown DM, Campochiaro PA, Singh RP, Li Z, Gray S, Saroj N, et al. Ranibizumab for macular edema following central retinal vein occlusion: six-month primary end point results of a phase III study. Ophthalmology. 2010 Jun. 117(6):1124-1133.e1. [Medline]. Varma R, Bressler NM, Suñer I, Lee P, Dolan CM, Ward J, et al. Improved Vision-Related Function after Ranibizumab for Macular Edema after Retinal Vein Occlusion: Results from the BRAVO and CRUISE Trials. Ophthalmology. 2012 Jul 17. [Medline]. Spaide RF, Chang LK, Klancnik JM, et al. Prospective Study of Intravitreal Ranibizumab as a Treatment for Decreased Visual Acuity Secondary to Central Retinal Vein Occlusion. Am J Ophthalmol. 2008 Oct 17. [Medline]. Heier JS, Campochiaro PA, Yau L, Li Z, Saroj N, Rubio RG, et al. Ranibizumab for macular edema due to retinal vein occlusions: long-term follow-up in the HORIZON trial. Ophthalmology. 2012 Apr. 119 (4):802-9. [Medline]. [Full Text]. Larsen M, Waldstein SM, Boscia F, Gerding H, Monés J, Tadayoni R, et al. Individualized Ranibizumab Regimen Driven by Stabilization Criteria for Central Retinal Vein Occlusion: Twelve-Month Results of the CRYSTAL Study. Ophthalmology. 2016 May. 123 (5):1101-11. [Medline]. [Full Text]. Boyer D, Heier J, Brown DM, Clark WL, Vitti R, Berliner AJ, et al. Vascular endothelial growth factor Trap-Eye for macular edema secondary to central retinal vein occlusion: six-month results of the phase 3 COPERNICUS study. Ophthalmology. 2012 May. 119(5):1024-32. [Medline]. Ogura Y, Roider J, Korobelnik JF, Holz FG, Simader C, Schmidt-Erfurth U, et al. Intravitreal aflibercept for macular edema secondary to central retinal vein occlusion: 18-month results of the phase 3 GALILEO study. Am J Ophthalmol. 2014 Nov. 158 (5):1032-8. [Medline]. [Full Text]. Korobelnik JF, Holz FG, Roider J, Ogura Y, Simader C, Schmidt-Erfurth U, et al. Intravitreal Aflibercept Injection for Macular Edema Resulting from Central Retinal Vein Occlusion: One-Year Results of the Phase 3 GALILEO Study. Ophthalmology. 2014 Jan. 121 (1):202-8. [Medline]. [Full Text]. Heier JS, Clark WL, Boyer DS, Brown DM, Vitti R, Berliner AJ, et al. Intravitreal aflibercept injection for macular edema due to central retinal vein occlusion: two-year results from the COPERNICUS study. Ophthalmology. 2014 Jul. 121 (7):1414-1420.e1. [Medline]. [Full Text]. Kriechbaum K, Michels S, Prager F, et al. Intravitreal Avastin for macular oedema secondary to retinal vein occlusion: a prospective study. Br J Ophthalmol. 2008 Apr. 92(4):518-22. [Medline]. Epstein DL, Algvere PV, von Wendt G, Seregard S, Kvanta A. Benefit from bevacizumab for macular edema in central retinal vein occlusion: twelve-month results of a prospective, randomized study. Ophthalmology. 2012 Dec. 119 (12):2587-91. [Medline]. Qian T, Zhao M, Wan Y, Li M, Xu X. Comparison of the efficacy and safety of drug therapies for macular edema secondary to central retinal vein occlusion. BMJ Open. 2018 Dec 28. 8 (12):e022700. [Medline]. [Full Text]. Iftikhar M, Mir TA, Hafiz G, Zimmer-Galler I, Scott AW, Solomon SD, et al. Loss of Peak Vision in Retinal Vein Occlusion Patients Treated for Macular Edema. Am J Ophthalmol. 2019 Apr 4. [Medline]. [Full Text]. Central Vein Occlusion Study Group. A randomized clinical trial of early panretinal photocoagulation for ischemic central vein occlusion. The Central Vein Occlusion Study Group N report. Ophthalmology. 1995 Oct. 102(10):1434-44. [Medline]. Central Vein Occlusion Study Group. Central vein occlusion study of photocoagulation therapy. Baseline findings. Online J Curr Clin Trials. 1993 Oct 14. Doc No 95:[Medline]. Browning DJ, Rotberg MH. Vitreous Hemorrhage complicating laser-induced chorioretinal anastomosis for central retinal vein occlusion. Am J Ophthalmol. 1996 Oct. 122(4):588-9. [Medline]. Eccarius SG, Moran MJ, Slingsby JG. Choroidal neovascular membrane after laser-induced chorioretinal anastomosis. Am J Ophthalmol. 1996 Oct. 122(4):590-1. [Medline]. Luttrull JK. Epiretinal membrane and traction retinal detachment complicating laser- induced chorioretinal venous anastomosis. Am J Ophthalmol. 1997 May. 123(5):698-9. [Medline]. McAllister IL, Constable IJ. Laser-induced chorioretinal venous anastomosis for treatment of nonischemic central retinal vein occlusion. Arch Ophthalmol. 1995 Apr. 113(4):456-62. [Medline]. Mirshahi A, Roohipoor R, Lashay A, et al. Surgical induction of chorioretinal venous anastomosis in ischaemic central retinal vein occlusion: a non-randomised controlled clinical trial. Br J Ophthalmol. 2005 Jan. 89(1):64-9. [Medline]. Beck AP, Ryan EA, Lou PL, et al. Controversies regarding radial optic neurotomy for central retinal vein occlusion. Int Ophthalmol Clin. 2005 Fall. 45(4):153-61. [Medline]. Friberg TR, Smolinski P, Hill S, et al. Biomechanical assessment of radial optic neurotomy. Ophthalmology. 2008 Jan. 115(1):174-80. [Medline]. Opremcak EM, Bruce RA, Lomeo MD, et al. Radial optic neurotomy for central retinal vein occlusion: a retrospective pilot study of 11 consecutive cases. Retina. 2001. 21(5):408-15. [Medline]. Weizer JS, Stinnett SS, Fekrat S. Radial optic neurotomy as treatment for central retinal vein occlusion. Am J Ophthalmol. 2003 Nov. 136(5):814-9. [Medline]. Arevalo JF, Garcia RA, Wu L, et al. Radial optic neurotomy for central retinal vein occlusion: results of the Pan-American Collaborative Retina Study Group (PACORES). Retina. 2008 Oct. 28(8):1044-52. [Medline]. Leizaola-Fernandez C, Suarez-Tata L, Quiroz-Mercado H, et al. Vitrectomy with complete posterior hyaloid removal for ischemic central retinal vein occlusion: series of cases. BMC Ophthalmol. 2005 May 20. 5:10. [Medline]. (unpublished) A randomized, double-masked, sham-controlled phase 3 study of the efficacy, safety and tolerability of repeated intravitreal administration of VEGF trap-eye in subjects with macular edema secondary to central retinal vein occlusion (CRVO) (GALILEO). ClinicalTrials.gov Identifier: NCT01012973. Bashshur ZF, Ma'luf RN, Allam S, et al. Intravitreal triamcinolone for the management of macular edema due to nonischemic central retinal vein occlusion. Arch Ophthalmol. 2004 Aug. 122(8):1137-40. [Medline]. Ip MS, Gottlieb JL, Kahana A, et al. Intravitreal triamcinolone for the treatment of macular edema associated with central retinal vein occlusion. Arch Ophthalmol. 2004 Aug. 122(8):1131-6. [Medline]. 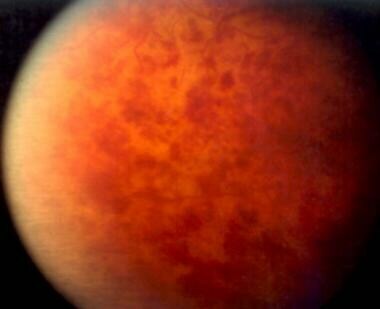 Patel PJ, Zaheer I, Karia N. Intravitreal triamcinolone acetonide for macular oedema owing to retinal vein occlusion. Eye. 2008 Jan. 22(1):60-4. [Medline]. Ramchandran RS, Fekrat S, Stinnett SS, et al. Fluocinolone acetonide sustained drug delivery device for chronic central retinal vein occlusion: 12-month results. Am J Ophthalmol. 2008 Aug. 146(2):285-291. [Medline]. Epstein DL, Algvere PV, von Wendt G, Seregard S, Kvanta A. Bevacizumab for Macular Edema in Central Retinal Vein Occlusion: A Prospective, Randomized, Double-Masked Clinical Study. Ophthalmology. 2012 Mar 16. [Medline]. Haller JA, et al. Intravitreal aflibercept injection (IAI) for macular edema secondary to branch retinal vein occlusion (BRVO): 24-week, results of the VIBRANT study. Presented at the 38th annual Macula Society meeting. Scottsdale, AZ. February 21, 2014. Central retinal vein occlusion showing significant disc edema with dilated tortuous veins and scattered retinal hemorrhages. Fluorescein angiogram of the same patient with central retinal vein occlusion in as in previous image, showing leakage from disc, staining of retinal veins. Fundus of a patient with nonischemic central retinal vein occlusion, showing few scattered peripheral fundus hemorrhages. Scattered retinal hemorrhages in a patient with central retinal vein occlusion. Fluorescein angiogram of a patient with nonischemic central retinal vein occlusion, showing staining of dilated tortuous veins with leakage into macula in a cystoid pattern. Fluorescein angiogram of the same patient as in previous image, showing perifoveal capillary leakage in a cystoid pattern in late phases of angiogram. Late phase of fluorescein angiograph of the same patient as in previous image, showing cystoid pattern of leakage from perifoveal dilated leaking capillary network. Arteriovenous phase of fluorescein angiograph showing perifoveal capillary leakage in a patient with nonischemic central retinal vein occlusion. Fundus picture of a well-compensated, old central retinal vein occlusion showing optociliary shunt vessels. Red-free photo of the same patient with central retinal vein occlusion as in the previous image, showing prominent optociliary shunt vessels.